Saturday night's Bernard Hopkins-Chad Dawson title fight will be worth the pay-per-view money. The undercard has big names, up-and-coming prospects, and future world champions. The Antonio Demarco-Jorge Linares fight promises to be fun to watch. Prospect Danny Garcia can become a serious contender if he knocks off former champion Kendall Holt. Paulie Malignaggi is worth watching strictly to see his ring attire and to listen to his post-fight comments. But the main event will be more action-packed than people believe. 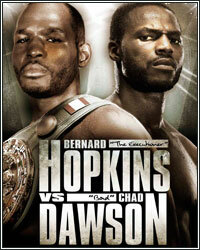 Bernard Hopkins is going to test Chad Dawson's heart by bringing the fight to "Bad Chad". Win or lose, B-Hop will either bring out the best in Dawson, or the worst. Either way, it will be entertaining. Don't miss Fighthype Radio's Hopkins-Dawson preview show Wednesday night with hosts Vivek Wallace and Danny Howard. The two will break down the entire pay-per-view card and will have special guest IBF light heavyweight champion Tavoris Cloud on the show. While Manny Pacquiao may be liked by most, Juan Manuel Marquez is not most. Watching the HBO Face Off with Max Kellerman, you can truly see how much bad blood still boils inside of Marquez. He looked ready to fight Pacquiao right then and there. The two looked uncomfortable just standing next to each other. Make no mistake though, Pacquiao isn't all warm and fuzzy inside either. Pacquiao should dominate the fight, but guarantee Marquez will bring the fight early on and put pressure on Pacquiao. Counter-puncher or not, Marquez knows he has to set the tone early or it will be an early exit. Miguel Cotto's recent decisions are forcing serious questions about his confidence against Antonio Margarito. It all started with Cotto's insistence on a catchweight. The final result, a 153-pound limit, just one pound below the jr. middleweight limit. Now Cotto announces a change in trainers, from Emanuel Steward to Pedro Luis Diaz. I remember reading a story awhile back when Steward said Cotto didn't really want the rematch with Margarito in the first place. While I thought it was rubbish when I read it, maybe there is some truth to it. Everyone, including myself, is looking at this fight as redemption for Cotto because most believe Margarito probably had loaded gloves the first time around. But as we get closer, Cotto's decisions are making me second-guess the belief in himself that he can get past the "Tijuana Tornado". Cotto didn't look spectacular in his fight against Ricardo Mayorga, and the last fight with Margarito was fought at welterweight. Whether or not Margarito had loaded gloves, he was still walking through Cotto's shots and continued coming forward. Now at a higher weight class, it's difficult to believe Cotto can seriously hurt Margarito. The closer this fight gets, the more and more I'm beginning to lean towards Margarito. Amir Khan is doing a lot of talking, but at least he is backing it up in the ring. With each fight, Khan has looked better and better. He is gaining more confidence and his arrogant, cocky side is coming out in the media. His decision to fight Lamont Peterson in Peterson's hometown of Washington D.C. on December 10th is yet another sign of his desire to be recognized by the American public. Khan knows the key to a fight with Floyd Mayweather is for the American public to know his name. If he keeps winning, which I believe he will against Peterson, there is no reason to believe he won't get a fight with Mayweather late next year. Kell Brook is not on the same level as Khan. Britain's other golden child looked impressive with his 6th round TKO win over Rafal Jackiewicz Saturday night, but Khan would win enough rounds early to cruise to a late stoppage win, or a unanimous decision victory. Brook is a big welterweight whom Khan may have trouble stopping, but Khan's speed and quickness would be too much. Brook has the power, but can't keep up with Khan. This is a fight that could definitely happen in the spring of 2012 in England. HBO would be all over it and both fighters would make seven figures because of their popularity in the U.K. This would be a perfect debut welterweight fight for Khan. Mexicans still produce the most entertaining fights. While receiving limited notoriety in the United States, lower weight division Mexican fighters always seem to produce the most fireworks in their bouts. In Saturday night's Top Rank Live telecast, Rodrigo Guerrero and Raul Martinez put on an entertaining show in Mexico. Whatever you think about Bob Arum, the man knows how to promote a fight. Timothy Bradley knows that fact all too well, which is why he signed with Top Rank. Not to say that Gary Shaw and Ken Thompson didn't promote Bradley the right way, but the depth within the Top Rank stable will guarantee Bradley a big payday as long as he keeps winning. Bradley clearly knew what he wanted to do after he beat Devon Alexander back in January. He probably didn't expect to wait 10 months to get back in the ring, but as they say, "the wait will be worth the reward." Bradley will make seven figures fighting on the undercard of the Pacquiao-Marquez pay-per-view telecast, and will face faded, former champion, 40-year-old Joel Casamayor. Business-wise, this is a much better tune-up fight for a Manny Pacquiao showdown than Amir Khan would have been. Bradley will probably go all 12 with Casamayor, but he needs the rounds to shake off the ring rust. I have no doubts that Tavoris Cloud is a victim of Don King's greed. Rumor has it that the only thing preventing Cloud from a big payday fight against Jean Pascal in Canada was King asking for options on future Pascal fights. Whether it is true or not, King has a reputation for being an unreasonable businessman who tries to steal every penny he can. Another problem is Cloud's trainer, Al Bonnani. Don't get me wrong, I like Al Bonnani personally. He is always willing to chat and will tell it like it is, but facts are facts. Al Bonnani is on Don King's payroll, which presents a conflict of interest. The sooner Cloud gets away from Don King, the sooner he becomes a household name. His fighting style is worthy of it. It must be nice to be the Klitschko brothers. Wladimir will be back in the ring December 10th in Germany defending his titles against former crusierweight champion Jean Marc Mormeck. Klitschko is going to make several million, Mormeck will probably make about half a million, and Klitschko will stop Mormeck in the middle rounds. The best part for Wlad is Mormeck won't be able to touch him. One has to wonder, is the heavyweight division that bad with no real contenders, or are the Klitschko brothers that good? Juan Manuel Lopez isn't who we thought he was. I got a chance to go back and watch Juanma's fight from last Saturday night and he did not look impressive at all. Taking a page from former NFL Head Coach Dennis Green, had Lopez fought Yuriorkis Gamboa like Bob Arum was hoping, it would have been no contest. Lopez looked slow, tired, and sluggish in his 2nd round knockout victory against an overmatched Mike Oliver. In earning the victory, Lopez took way too many shots and has not improved defensively in his last few bouts. Don't be surprised if we see the same result when he gets his rematch with Orlando Salido, a Salido knockout victory. If Lopez and Gamboa ever do square off, it could be the beginning of the end for Juanma. That's all I've got for now. Send your comments/questions to dkassel@fighthype.com, be sure to "Like" The Boxing Observer on Facebook, and follow me on Twitter @BoxingObserver.